A hot summer with cool nights until the end of the harvest. A striking colour for a 19 year old wine. The nose is profound and sweet, with black truffle, under-wood, and earthy notes. The mouth is fruity, fleshy and round, with soft tannins. It can be drunk but will improve with time. "Fine structure, marked by notes of liquorice and spices. Aromatic and never-ending finale, this wine is now flourishing. Magnificent, it will be great with a gastronomic meal." "The nose is on notes of damp forest, mushrooms and humus. The fruit, the tension, the freshness and the spices give this wine unbelievable balance and complexity. This wine can be enjoyed now or can be kept a few more years. Stand the bottle upright 48 hours before serving to avoid any deposit." "Surprisingly pale in colour with earthy, leather notes and cherries pushing through on the mid-palate. Silky, ripe tannins." "After the 1998, a sudden jump to all the signs of maturity: herbs and leather and undergrowth but still fragrant on the mid palate. Silky and sweet in the mouth with a touch of black truffle and tobacco leaf. Tannins are resolved but still a little foursquare." "Two great back to back vintages are the 1990 and 1989. The more developed 1990 boasts an incredible perfume of hickory wood, coffee, smoked meat, Asian spices, black cherries, and blackberries. 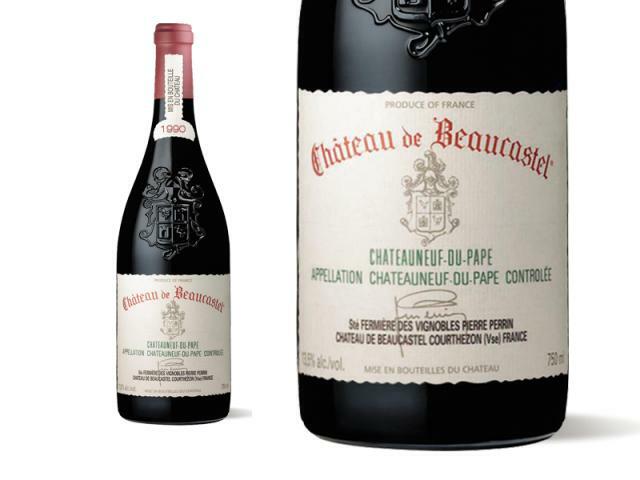 Lush, opulent, and full-bodied, it is a fully mature, profound Beaucastel that will last another 15-20 years. " "It's a generous, concentrated, intensely fruity Châteauneuf that blends mouthfilling flavors with complex cedar, spice and leather accents. Sturdy tannins and solid acidity mark this as a good candidate to cellar. Best after 1996." "Medium ruby in color, this wine smells of bacon fat, cedar, and exotic incense with a hint of dried flowers. In the mouth the wine has fine grained tannins that have a supple tension to them. Still coiled tight, the cedar, cherry and sandalwood flavors are more linear than the '89 but no less compelling. Gorgeous acidity and balance. Great length and poise. This wine has a long way to go yet. The finish is deeply mineral and resonant. Stunning." "The depth and volume of fruit being quite extraordinary, the wine of the evening: for me, a perfect 100-pointer."